Featured here is Isabella Gong, photographer and player since fall 2012. She’s played with Penn Quidditch and the Philadelphia Honey Badgers. She was a beater her first year and now plays as a chaser. Quidditch made her the athlete she is today. At US Quidditch Cup 9 (USQC9), Gong will be leading the photo team, ensuring that as many games as possible have photography coverage. She’ll also be taking pictures of her own. At USQC9, photographers will be working tirelessly to capture the pivotal moments of some of the most anticipated matches of the year. Working alongside hundreds of volunteers, their contributions are essential. Photo by Kevin Freeman. 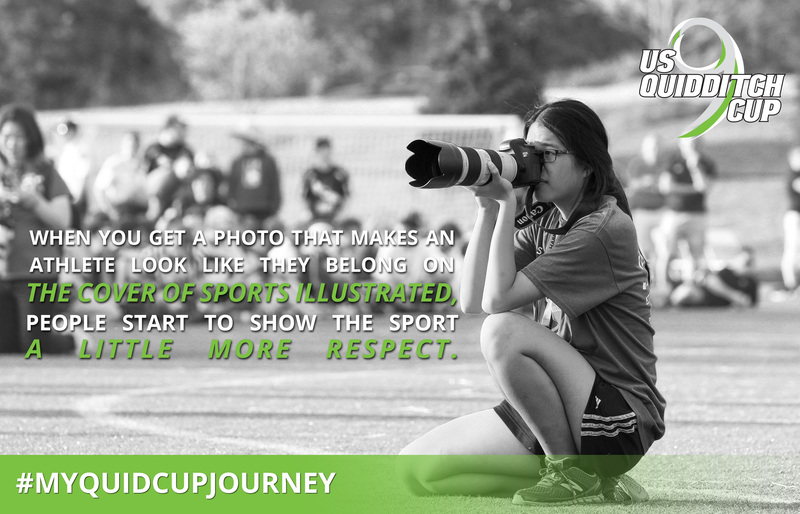 #MyQuidCupJourney gives a firsthand account of what it takes to compete at the highest level. Part of our national championship since World Cup VII in 2014, it showcases the best in the sport. To see the first two entries, the Chaser and Referee, click here and here.